"Edgy short stories about women in trouble abroad and at home.The characters in Ermelino's 16 quick stories get around. They crack jokes, take opium, have ill-considered assignations, and are lucky to get out alive (some don't). There are a lot of great lines and a few truly timeless questions." "A collection of arresting short stories that call to mind the work of Lucia Berlin in their sparse realism and humor, as well as their fine attention to the often-harsh details of women's lives.... Birth and death, love and friendship, drugs and violence, home and abroad: the stories' themes are elemental and affecting, lingering in the mind like parables or myths sketching something vital, sad, and true." "Edgy short stories about women in trouble abroad and at home....The characters in Ermelino's 16 quick stories get around. They crack jokes, take opium, have ill-considered assignations, and are lucky to get out alive (some don't). There are a lot of great lines and a few truly timeless questions." "Admit it, you've always fantasized about being tough and adventurous, about crossing swords with the Mafia or sleeping with strangers and smoking opium-laced hashish. Reviews Director at Publishers Weekly Ermelino takes you there with strong-willed female characters circling through New York's Italian American neighborhoods and far-off India and Afghanistan." "Many of Ermelino's short tales hinge on recollections that evolve into deeper connections and realities.... Spanning perception, continents, and time, Ermelino's 16 tales stealthily explore her characters' unwieldy predicaments and conflicting desires." "What Louisa Ermelino knows about the heart could fill a book and has. The unadorned authenticity of her prose is so powerful, it gave me whiplash. I readMalafemmena in one sitting and wanted more, more, more. The writer's a genius, or an alchemist, or maybe both. "Patricia Volk, author ofStuffed and Shocked. 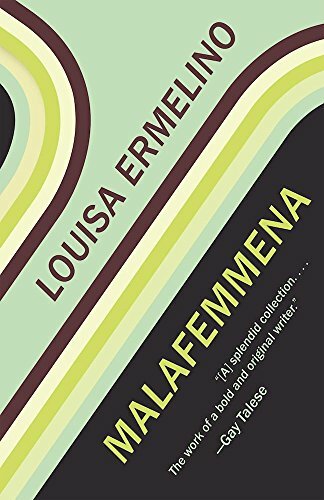 Louisa Ermelino's vibrant stories follow women living dangerously at home and abroad, whether in Italian-American neighborhoods or in the countriesIndia, Turkey, Afghanistanwhere they seek to escape the circumstances of their former lives. At home, they break ancient Italian taboos and fall victim to mobsters. Overseas, they smoke opium-laced hashish and sleep with strange men. Ermelino's prose is vivid and boisterous, and her characters are vital, dynamic, and wholly memorable. Louisa Ermelino is the author of three previous novels: Joey Dee Gets Wise(Kensington, 2004), The Black Madonna (Simon & Schuster, reprint, 2013), andThe Sisters Mallone (Simon & Schuster, reprint, 2013). She is Vice President and Reviews Directorat Publishers Weekly in New York City.